So I love going to garage sales but not for the reason you might think. Yes I love a good bargain and yes I get super excited when I find spectacular organizing tools for cheap BUT the real reason I love to hit up the garage sales every Friday night is because it’s date night with my middle son (13). This is something we love to do together and the rest of the family couldn’t be bothered so off my son and I go and for two or three glorious hours (I try and stretch it out as long as possible) and I get him all to myself just to chat and shop and just be. I love every single minute of it. As for having garage sales, I gave that up long ago. I’ve done maybe three in my lifetime and I don’t think I’ll ever do it again. They are just so much work and I am just way too lazy. One of the things I hate the most about having a garage sale is storing all the stuff somewhere in my house beforehand. I don’t have that kind of real estate so it’s just not worth it to me. Once I decide to get rid of my stuff I just want it gone (which is why I purge weekly), I don’t want to have to see it again and have it play with my emotions. Blech. The other thing I can’t stand is the haggling over a 5 cent item. Forget about it. I.Just.Can’t.Do.It. I live in a small community and the return really doesn’t justify the work involved. Well except perhaps for the time I had my “no more babies” garage sale. I found out baby stuff tends to sell well. I also later found out I wasn’t done having babies. Oops! 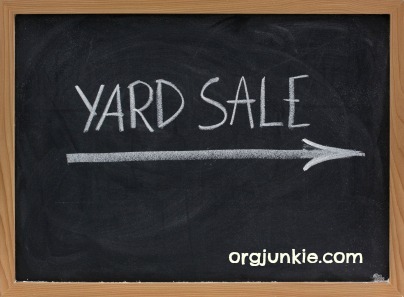 However if hosting a garage sale is your thing, don’t let me stop ya, here are some great links to help you have a really successful sale. 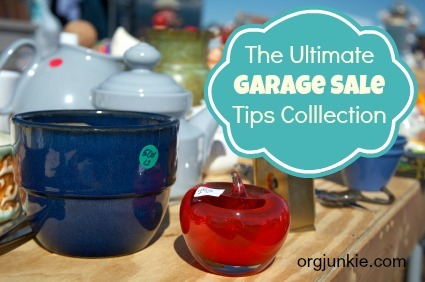 There you have it, everything you need to make this garage sale season your BEST one yet. Three cheers for a bargain…whoot, whoot, whoot!! If you found this post helpful, would you take a moment to click the buttons below to share it. Thanks! Ha!! I remember the no more baby garage sale…when I got all the stuff for my baby (before I even got pregnant)! I miss our garage sale dates…funny that you guys have Friday garage sales like we do here. Thank you so much for featuring my Garage Sale Checklist. Good Luck to everyone planning a sale! 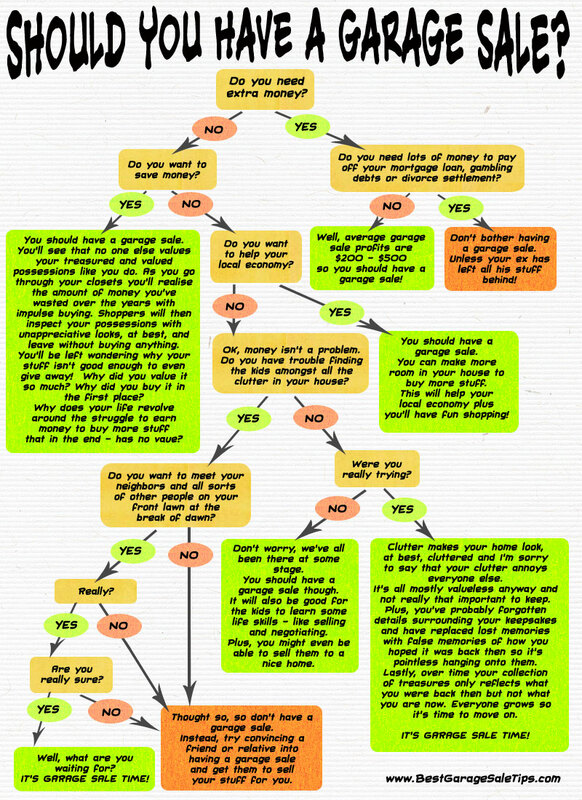 Love the should you have a garage sale flowchart – I guess it’s saying I should! Wow, thanks for adding me to your list of tips for going to garage sales. Way cool! Loved the flow chart and I will totally be checking out the other links for tips! Great blog! The ultimate tip, I think is to sale during a city wide garage sale. There’s nothing like walking down the street going from house to house treasure hunting. Great post, Laura! YAY garage sales! Great post Laura and we love the flow chart! Take care and have a great day on purpose! Wow! 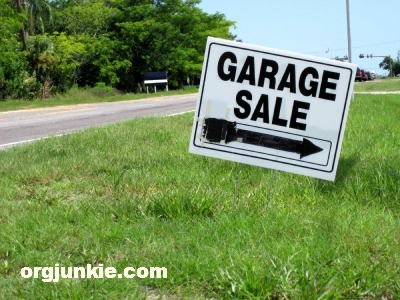 these are some awesome resources for getting a successful garage sale. I also did a yard sale before we moved last year and it was a grand successful.